This exquisite ring is called “forever“This exquisite and unusual ring is called "forever" and is new to our range. Pictured in white gold, It has diamonds half way around the ring. and is new to our range. 9ct gold. 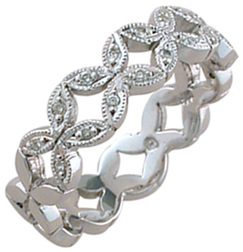 This exquisite and unusual ring is called "forever" and is new to our range. Pictured in white gold, It has diamonds half way around the ring. ID302 Univesal - Ladies , Love crosses all boundaries; it is not confined by time or place.